William Floyd alumnus P. J. Cinque (Class of 2005) and a Juilliard-trained double bassist, recently won a position with the San Diego Symphony, a spot for which he competed among some of the world’s most talented musicians through several rounds of a rigorous audition before an orchestra committee and music director Jahja Ling. Cinque earned both a Bachelors and Masters degree in double bass performance from The Juilliard School. He has performed in major venues around the world, including Carnegie Hall, the Kennedy Center, Alice Tully Hall, Avery Fisher Hall, Cincinnati Music Hall, Suntory Hall, the Beijing Concert Hall, and the Shanghai Grand Theatre. In 2009, Cinque traveled to Japan to participate in the Pacific Music Festival and spent three summers at the Aspen Music Festival and School as a fellowship student. A committed chamber musician, P.J. participated in Denmark’s Thy Chamber Music Festival and the Kennedy Center’s fifth anniversary of the Conservatory Project. Outside of the classical music realm, he passionately explores music of different genres through arranging and performing with bands and other small ensembles, including his double bass duo, Low Bros. The San Diego Symphony performed its first concert on December 6, 1910 in the Grand Ballroom of the then-new U.S. Grant Hotel. Now, the San Diego Symphony has grown into one of the top orchestras in the country both artistically and financially. With a current budget of $20 million, the San Diego Symphony is now placed in the Tier 1 category as ranked by the League of American Orchestras. Three William Floyd Teachers Obtain National Board Certification! The William Floyd High School students and their teachers who worked on the multi-sensory room (back row, left to right): Al'Lyah King; art teacher, Susan Plunket; Sophia Zoller; Stephanie Bondietti; Katherine Moya; Tasia El-Quhir; Nia Scott; and special education teacher, Christine Inzerillo. (Front row, left to right): Carolina Fuentes; Celina Cruz; and art teacher Theresa Bianco. The William Floyd Special Education Department and the William Floyd High School Art Department recently collaborated on a multi-sensory room, an inclusive space where students with special needs can engage and explore their senses. The room, designed for the high school’s 8:1:1 students and depicting an underwater sea environment, was painted under the direction of art teachers, Theresa Bianco and Susan Plunket. The William Floyd High School Best Buddies Club and the Student Government were also instrumental in raising funds to make this room possible. Clockwise from top left: varsity volleyball, girls varsity cross country, junior varsity field hockey and boys varsity cross country. Four William Floyd athletic teams – girls varsity cross country, boys varsity cross country, varsity volleyball and junior varsity field hockey – received Section XI Outstanding Sportsmanship Awards for the Fall 2014 season. Section XI is the governing body for all high school athletics in Suffolk County. Teams earn these awards based on ratings that are submitted by opponents and officials throughout the season. Each team will receive a certificate from Section XI acknowledging this honor. Congratulations to the teams and their coaches: girls varsity cross country, head coach Jillian Sanders and assistant coach Richard Sinclair; boys varsity cross country, head coach Ed Noll and assistant coach Matt Hansen; varsity volleyball, head coach Jennifer Tufano and assistant coach Amy Weinman; and junior varsity field hockey head coach Eric Shapiro. WFUT REPRESENTS AT HOLIDAY PARADE! Pictured are the William Paca Arctic Warriors (left) and Ed Noll and Mike Barba (right) from Moriches Elementary School. Recently, William Floyd School District staff members participated in the “Freezin’ for a Reason” Polar Plunge at Cedar Beach in Mount Sinai to benefit the Special Olympics of Brookhaven Town. Teams from William Paca Middle School and Moriches Elementary School braved the icy waters of the Long Island Sound to help support local Special Olympics athletes. Participants from William Paca Middle School included Wendy Gottlieb, Susan Piraino, Lisa Borak, Jenn Engmann, Teri Busardo, Joanne Fucci, Deb Turchiano, Janella Walker and Donna Lauria (retired), who raised $1,875 in the plunge; Ed Noll and Mike Barba from Moriches Elementary School who raised $470 with support from more than 100 students; Nick Taylor, Chairperson, Committee on Special Education for the middle schools who raised $190; Kat Jumper from Tangier Smith Elementary School; and Gayle Lambert and Don Law from William Floyd High School. The Special Olympics of New York has more than 64,000 athletes training and competing year round to compete in 22 Olympics-style events. Athletes and families are never charged to participate, therefore, the Special Olympics relies completely on fundraising. Honors Band selections Anthony Hristidis (left) and Zachary Neikens (right) are pictured with Dawn Conefry, William Floyd Middle School Band Director. Two William Floyd Middle School trombone players – Anthony Hristidis and Zachary Neikens – have been selected to represent their school and their district at the annual New York State Band Directors Association (NYSBDA) All-State Middle School Honors Band festival next March in Syracuse, NY. These two eighth-grade trombonists were selected from a group of more than 260 applicants nominated from across the state. In order to receive a nomination, student musicians must demonstrate musical talent, accomplishment, citizenship and responsibility. They must also have showcased outstanding musical ability on their New York State School Music Association (NYSSMA) solo evaluation the previous spring. The final selection of NYSBDA All-State Honors Band members is conducted by a committee of NYSBDA board members who carefully reviewed the recommendations, student NYSSMA solo evaluation sheets, essays and academic records. 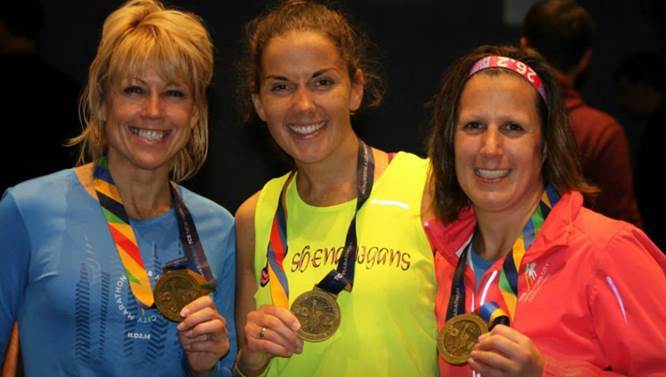 Kristin McNamara (right) with friends celebrates finishing the NYC Marathon with her medal. Congratulations to William Floyd employees Constance Lawson, a nurse at William Paca Middle School, and Kristin McNamara, a teacher at John S. Hobart Elementary School, who ran and finished the 2014 New York City Marathon held on Sunday, November 2. Ms. Lawson, who has now run a total of five marathons – the NYC Marathon, the Virginia Beach Marathon and the Chicago Marathon (three times), said that it was the most amazing [marathon] experience that she has ever had. “Nothing compares to the supportive New Yorkers lining the streets and cheering the runners on!” She plans on running the Boston Marathon in April 2015. Ms. McNamara, who started training for the marathon in June with 5 am runs, track workouts and long-distance runs, said that despite it being cold and windy, she was able to run her personal best marathon time by 23 minutes. John S. Hobart Elementary students get ready to share their vocabulary words in front of their classmates and family members. To enhance their vocabulary while at the same time having a little fun, students in Grace Ryan’s, Matt Miller’s and Rebecca Gaddis’s fifth-grade classes at John S. Hobart Elementary School, participated in “Vocabulary Hat Day,” a fun and educational day based on the book “Miss Alaineus: A Vocabulary Disaster.” Students were assigned a word that they researched and had to construct a sentence around. They also wrote out the word and placed it on their hats. 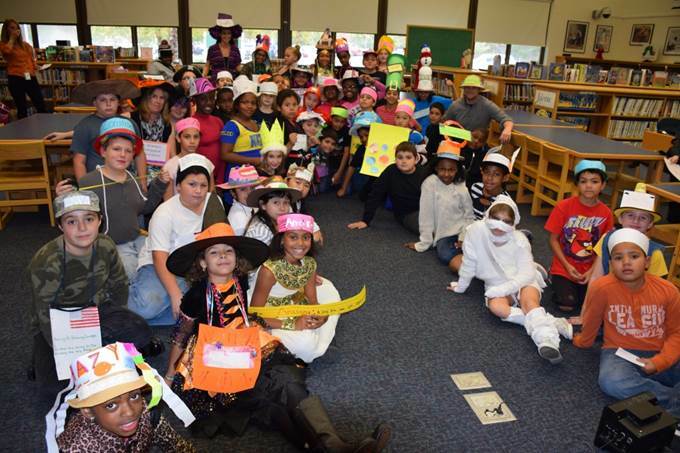 Then on Vocabulary Hat Day, family members were invited to hear the students talk all about their words. 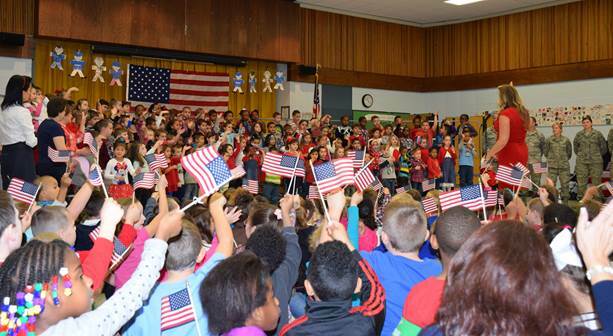 Students sing patriotic songs and wave American flags at the Tangier Smith Elementary School concert. In honor of Veterans Day, kindergarten- and first-grade students at Tangier Smith Elementary School in the William Floyd School District, held their annual Veterans Day concert and had the opportunity to express their gratitude to veterans for their service through the singing of songs and with the presentation of thank you cards. This annual event, organized each year by kindergarten teacher Wendy Gross, is filled with students singing patriotic songs such as “Yankee Doodle Dandy,” “I Pledge Allegiance,” “My Country ‘Tis of Thee” and more. In attendance were current and former service members from the American Legion Arthur H. Clune Post 1533 (Mastic Beach), the 106th Rescue Wing of the Air National Guard, as well as U.S. Army veteran and William Floyd alumnus Congressman-elect Lee Zeldin. New York State Assemblyman Ed Hennessey (also a William Floyd alumnus) and Suffolk County Legislator Kate Browning were also in attendance to thank our community’s veterans. Additionally, the William Floyd School District held a Veterans Day ceremony at the Armed Forces Memorial in front of William Floyd High School. The NJROTC presented the colors, there were student vocal performances (William Floyd High School and Nathaniel Woodhull Elementary School), as well as student speakers, Jen McDermott, President, WFHS Student Government, and Sebastian Santiago, a fifth grader at Nathaniel Woodhull Elementary School. Additionally, Robert Vecchio, President of the William Floyd Board of Education, after thanking our nation’s veterans for their service, announced that the first Long Island chapter of the “Our Community Salutes” program will begin right here within the William Floyd community. “Our Community Salutes” is a national non-profit designed to recognize and honor graduating high school students and their families who have made commitments to enlist in the armed services after graduation. William Floyd High School students and teachers are pictured at the Stony Brook University Staller Center for the Arts. Through a partnership with Stony Brook University, more than 40 William Floyd High School foreign language and music department students recently had the opportunity to attend a live performance of the Grammy Award-winning Spanish Harlem Orchestra at the Staller Center for the Arts. “Known for their outstanding performances of Latin jazz and salsa, students were immersed in a unique learning experience that was not only exceptionally musical, but also culturally authentic and primarily in Spanish,” said Ryan Feldscher, Lead Music Teacher, William Floyd School District. The event was organized by high school principal Barbara Butler, and teachers Amy Sckipp (music), Ryan Feldscher (music), Derek Robinson (foreign language), Esmeralda Soto (foreign language) and Carol Janowicz (foreign language). Special thanks to Stony Brook University and the Staller Center for the Arts for hosting the students and staff. Moriches Elementary School students Tristan Nash (at the microscope) and Josiah Lors from Ms. Shari Costello’s first-grade class enjoy gazing into the microscopic world. In the background are Lavonnie Seymore (at the microscope) as Alisson Rivera and Devon Jacobsen wait their turn. In collaboration with the William Floyd School District STEM (Science, Technology, Engineering and Mathematics) Program, students at Moriches Elementary School have been learning about science in a new, hands-on approach through the implementation of elementary school science labs. Under the direction of a school STEM Inquiry Team consisting of teachers and administrators, students are participating in actual hands-on laboratory experiments where they can apply the scientific method. One such experiment is centered around popping various types of popcorn. To help kick off the opening of these science labs, kindergarten- and first-grade students welcomed Dr. Aleida Perez, a virologist from Brookhaven National Laboratory. Dr. Perez spoke about the importance of science, what it takes to be a scientist and the tools that she uses in her work. Afterward, students had the opportunity to take an up-close look at some of those tools. Chemistry teachers (left to right) Kristen Drury, Terri Randall and Martin Palermo celebrate Mole Day. William Floyd High School students enrolled in Terri Randall’s, Martin Palermo’s and Kristen Drury’s Regents chemistry classes celebrated Mole Day on October 23, which is a day observed in schools nationwide from 6:02 am to 6:02 pm to commemorate (Amedeo) Avogadro’s Number 6.02 x1023. Avogadro’s Number is a basic measuring unit in chemistry that represents the amounts of a chemical substance. Mole Day is part of National Chemistry Week which was held this year between October 19-25. To commemorate Mole Day in Ms. Randall's and Mr. Palermo's classrooms, students participated in a hands-on inquiry experiment to determine the amount of carbon dioxide in Pop Rocks candy using the molar volume of a gas and solubility of a gas in water. Students dissolved the Pop Rocks in water and determined the amount of carbon dioxide that was trapped inside. At the end of the experiment, students used their calculations to dispel the myth that eating Pop Rocks while drinking a carbonated beverage could cause a person’s stomach to explode. Students also created “Happy Mole Day” cards in Ms. Randall's classroom and presented them to William Floyd High School faculty and staff to help educate them about the chemistry Mole. Ms. Drury shared a Mole Day presentation and students created baked goods based on the Mole Day theme. Pictured are left to right: Amy Sckipp (orchestra teacher); Barbara D’Orio (chorus teacher), Calvin Arancibia, Marion Woodson, Jacqueline Engel, Brianna Balzano, Avalon Monti, Salvatore Palma, Giselle Castillo, Sasha Hameed, Sherby Michel, Dominick Perraglia, Rebecca Engel, Jeffrey Ingegno, Michael Walker, Hannah Jaynes, Elizabeth Ertola, Ryan Feldscher (chorus teacher) and Michael Cordaro (band teacher). Fifteen William Floyd High School students have been chosen to perform this November at the NYSCAME (New York State Council of Administrators for Music Education) All-County Music Festival, an honors festival for students who demonstrate excellence on their instruments or with their voices. The NYSCAME All-County students selected for their voices are: Marion Woodson, Brianna Balzano, Sasha Hameed, Rebecca Engel, Elizabeth Ertola, Jacqueline Engel, Dominick Perraglia, Hannah Jaynes, Michael Walker, Salvatore Palma and Giselle Castillo. Selected for their instrumental talents are: Calvin Arancibia (trombone); Daniel Cresci (horn); Avalon Monti (trumpet); and Jeffrey Ingegno (bass). Congratulations also to their teachers: Michael Cordaro (band); Barbara D’Orio (chorus); Ryan Feldscher (chorus); and Amy Sckipp (orchestra). Ms. Jennifer Colosa’s classes at William Floyd Elementary School spearheaded a “Socktober” sock and clothing drive to help the less fortunate. With the assistance of their fellow students at William Floyd Elementary School, they collected two carloads full of socks and clothing. Pictured with the students are Ms. Jennifer Colosa and student teacher Mr. Jonathan Germer. Inspired by Internet star Robby Novak (aka Kid President) and his declaration that October should be “Socktober” and a time to serve the homeless, students in Ms. Jennifer Colosa’s third-grade classes at William Floyd Elementary School, decided that they wanted to celebrate Socktober by helping those in need through a sock and clothing drive. To spread the word, students made morning announcements about Socktober and teachers showed Kid President’s video. Together, they collected hundreds of pairs of socks and other clothing, enough to fill two cars, which will help the less fortunate in their school and in the local community. The eight All-County Tennis players with Coach Dave Pia back row (l-r) Brooke Fernandez, Emily Fernandez, Kayla D’Addario and Antonette Viglione. Front row (l-r) Lisa Lin, Kelci Henn, Victoria Panicola and Zoe DaSilva. EIGHT GIRLS TENNIS PLAYERS EARN ALL-COUNTY HONORS! The William Floyd varsity tennis team under head coach Dave Pia put forth a phenomenal performance at the Individual Conference Tennis Tournament held last week at William Floyd. Out of 16 teams and 64 players, William Floyd finished in the top three spots for Doubles and in third and fourth in the Singles competition. Additionally, eight players – Kelci Henn, Lisa Lin, Kayla D’Addario, Antonette Viglione, Zoe DaSilva, Victoria Panicola, Emily Fernandez and Brooke Fernandez – earned a spot on the All-County Team. In Doubles, the team of Henn and Lin defeated teammates D'Addario and Viglione in the finals securing first- and second-place, respectively. DaSilva and Panicola defeated a team from Mercy High School for third place. In Singles, Emily Fernandez defeated her teammate and sister Brook Fernandez, with each finishing in third- and fourth-place. All eight girls will compete in the County Tennis Tournament at Smithtown East with the hopes of earning a spot on the All-State Team. Additionally, Christina Cali also earned a spot on the All-Division Team. Congratulations and good luck! Floyd Strong! "The Master Teacher Program creates a community of teacher experts dedicated to providing a first-rate learning experience for students across New York, and contributes to our efforts to attract and retain the best and the brightest in our STEM classrooms," Governor Cuomo said. "Investing in our teachers is investing in our students, and I am pleased to welcome and congratulate those who have already proven to be some of the highest-performing professionals in their field."